All I got was a 41 band. All I got were IgM bands -- could it be chronic Lyme? The Western Blot revisited. All I got was a 41 band - do I have Lyme? 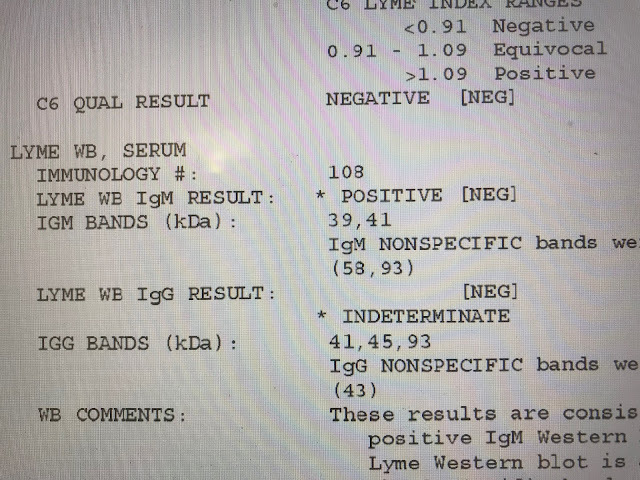 Lyme test is IgM positive, could it be chronic Lyme? If the text is too hard to follow or boring, there are pictures below. It helps if you know a little about laboratory medicine. The Western Blot and ELISA tests, the tests most often used, are indirect tests. Rather than looking for direct evidence of infection, e.g. finding specific DNA, These tests look for foot prints: Antibodies or specific immunoglobulins. These tiny proteins are made by the immune system in response to recognized pathogens (disease-causing) germs: bacteria, fungi, protozoans and viruses primarily. There are a lot of reasons why Lyme antibody tests are not that great: People are genetically programmed to respond differently; Lyme strains vary, species vary; the commonly used test is based on a single Lyme strain, you may be infected by another strain and cross reactivity with the test may be minimal. Perhaps most important: the test is incorrectly calibrated, based on false assertions. This is my opinion and is shared by others. Before we get to the Western Blot, let's first discuss the ELISA. Enzyme Linked Immunosorbent assay. This is the first test, the first tier used in the two tier test recommended by the CDC and IDSA. All diagnostic serological (from blood-serum) lab tests need controls, positive and negative. A positive control is a uses a standard serum with a high level of antibodies directed against Borrelia burgdorferi B31 strain. A negative control has no Lyme antibodies and is ostensibly derived from serum with no Lyme antibodies. (The availability of true negative controls has been a debatable point). The patient serum, which may or may not have Lyme antibodies, is tested with B31 derived antigen. The test requires a supply of Lyme antigen -- proteins and polysaccharides, which stimulate antibody formation derived from the B31 stain of Lyme. Antigens are sourced from a culture of Lyme bacteria. The culture may be "high passage." This means that the original culture has been "replanted" over many generations. Mutations may occur and change the antigens overtime. A culture of Lyme bacteria is put in a "blender," or sonicated to create a homogenate. ELISA. Sticky Lyme antigen is adhered to the surface of small wells . Serum is added. Lyme antibodies present in the patient test serum should tightly bind to the Lyme antigens on the bottom of the well. There is some nonspecific binding by "promiscuous" antibodies that apparently will stick to anything. The test well are washed thoroughly to remove debris and nonspecific antibodies. Sera is added in three separate experiments: positive control, negative control and patient serum. If the patient has Lyme antibodies the patient test wells should closely resemble the positive control. ELISA stands for Enzyme linked Immuno-sorbent assay. Antibodies are shaped like a Y with three legs and 3 points of contact which may bind to a receptor In the experiment described above, a secondary antibody is added to the well and this antibody specifically binds to a free receptor on Lyme antibodies bound to antigen on the surface of the wells. A protein called an enzyme is attached to a leg of this "secondary antibody". A color change occurs when a reagent is added, reacting with the bound enzyme. The intensity of color increases if more antibodies are bound to the antigen. Patient serum with a high concentration of Lyme antibodies and the positive control induce an intense color change.. If no Lyme antibodies are present no color change or only a slight color change occurs. A mild amount of color is thought to be normal and due to nonspecific, promiscuous antibodies bound to the Lyme antigens. Basically: More color, more antibodies; less color, fewer antibodies. A machine called a colorimeter measures the color intensity and the results are recorded as an index. A positive index is set based on "standard" recommendations. This test has the advantage of including all antibodies that might be present in the patient's serum. Antigens may be polysaccharide or protein. The Western Blot only measures responses to protein antigens. ELISA tests may have false negatives and false positives. The positive control is based on an ideal serum with a robust immune response, typically found in the acute phase of the disease. Excluded are: patients who have been sick for a long time, patients who have a weak immune response, patients with a different strain of Lyme and many others. The test is predicated on a single strain of Borrelia burgdorferi, the B31 strain. The test will like fail when a patient is infected with other strains and/or species of Lyme. This phenomenon is well known and well described in peer reviewed literature. Doctors talk about whether or not a test is sensitive or it is specific. A test is sensitive if it excludes false negatives. A test is specific when all the positive are "true positives." There is always a balance. When you increase sensitivity you decrease specificity. When you increase specificity you decrease sensitivity. /Lyme testing immediately raises a red flag. Why are two steps required, an ELISA followed by a Western Blot? The only other 2 tier test was for HIV. With improved technology a Western blot is no longer required with HIV testing. The war over Lyme testing is part of the war over most things Lyme. The Western Blot is considered both a sensitive and specific test. It is superior to the ELISA. A mix of Lyme antigens is placed into a gel. When an electric current is applied, Lyme proteins, antigens, separate out based on the weight of individual proteins. Antigenic proteins are spread out in a linear fashion across a gel. The separated proteins are transferred to a strip of nitrocellulose -- something like a strip of paper. The test proteins typically have molecular weights of 18 kilo Daltons to 93 kilo Daltons. The antigen/protein laden strips are incubated with serum. Three strips should be tested: positive control, negative control and patient serum. Antibodies present in the serum will bind to the individual proteins on the strips. A reagent is added and bars or bands appear across the strip. Band position and name corresponds to the molecular weight of the particular Lyme antigen. The WB shares with the ELISA the problem of what constitutes a positive reaction. A picture is worth a thousand words. Let me a review a few images, typical of what I work with on a daily basis. These results are from MDL. A specialty laboratory in NJ. This is an IgG strip. The test measures responses to 10 standard antigens and to the specific 31 and 34 bands removed decades ago because of vaccine development. The Bands are separated based on weight, 18-93. The 31 and 34 are added with a separate test so the numbers are out of place. The bottom strip is the positive control - high levels of specific antibody directed against the blot proteins. 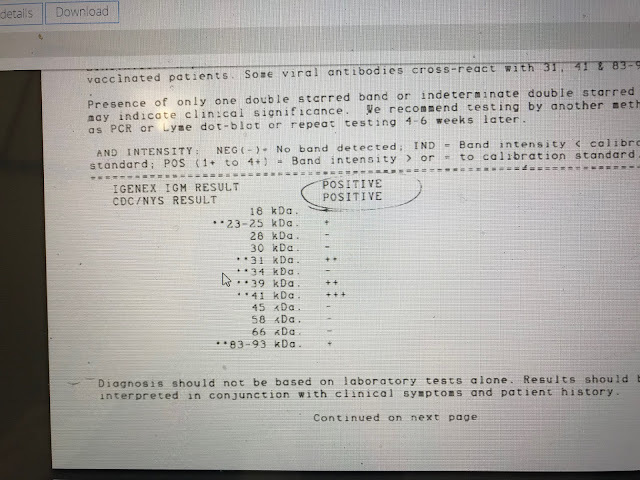 The top line is the patient result. No negative control is provided. CAVEAT; INTERPRETATIONS DISCUSSED ARE THE OPINION OF THE AUTHOR AND MAY BE CONTROVERSIAL AND OPPOSED BY MOST AUTHORITIES. This test is CDC negative. Patient antibodies react to nearly every band. This strip appears blatantly positive. However, according to the manufacturer, the intensity of the response is too weak to call positive. A band is considered positive if the intensity is at least 60% of the control. For example, the 93 band has an intensity of 45% of the control. Based on this standard, only the 41 band is counted positive. This interpretation is wrong, I think, because the lower limit of a positive results is incorrect -- based on incorrect assumptions regarding the control. I call this test positive. The total number of reactions is important and bands with intensities of 30% or higher should be considered. This is a negative IgM strip. Only the 41 band appears. The diagnosis of Lyme should not be based solely on the appearance of the 41 band which itself is considered less specific than several others. This is another example of a CDC negative which I consider positive. The 4 reported bands are all specific. The 39 band -- just 4 percentage points shy of the lab internal cutoff, is perhaps the most specific band, and to the best of my knowledge cross reactivity does not exist. The test is positive by other non-CDC internal laboratory criteria. This is a positive IgM strip. The test is reported CDC negative. The 41 and 23 bands together are considered positive by the CDC standard. There is a general consensus this criteria is accurate. The test would be reported negative however because the 41 intensity falls below the cut off point of 60%. What is of relevance, not taken into account by automated reading, is that the 23 band, the more specific band, is of an intensity greater than the control and therefore of greater significance. 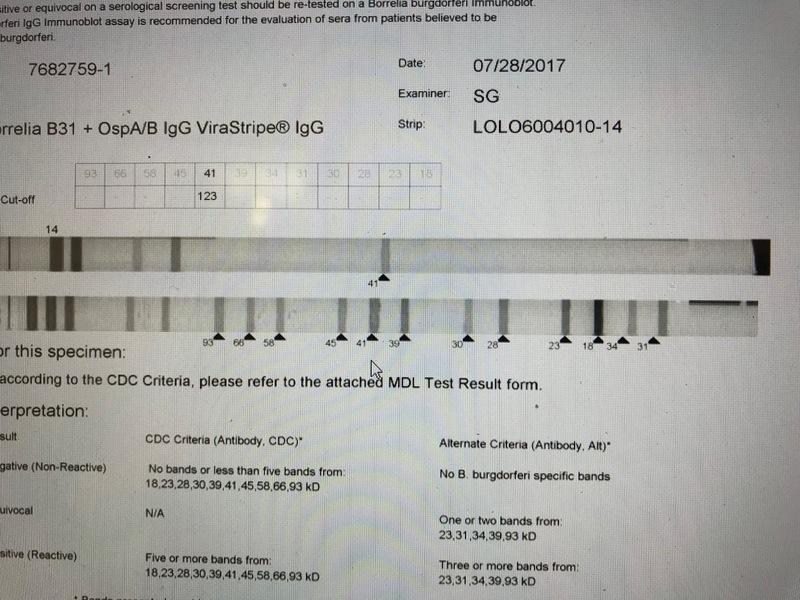 This is a typical LabCorp or Quest report. As you see, bands are not represented numerically. Bands are reported present or absent. The results are not determined by a computer which measures pixels, as in the case of MDL, but rather by a technician eyeballing the strips. These bands are highly specific, especially the 39 band. I consider this strip likely positive but I would repeat the test from a reference lab before passing judgement. This is a negative. 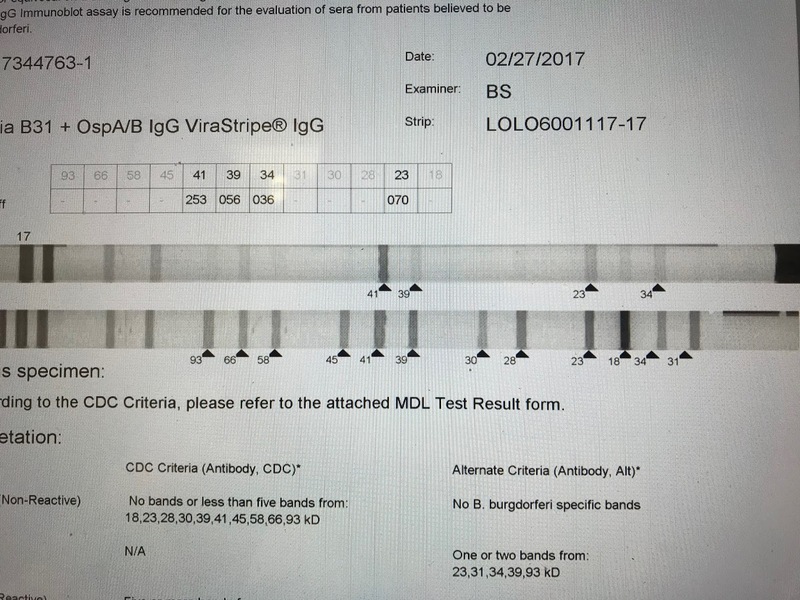 On this IgG strip only the 41 band is apparent and this is not enough to confirm Lyme serologically. This is report from Stony Brook. CDC bands are called specific and non-CDC bands are called nonspecific. Novel bands, not available through other reference labs are reported and may be very helpful. Unfortunately , no images. 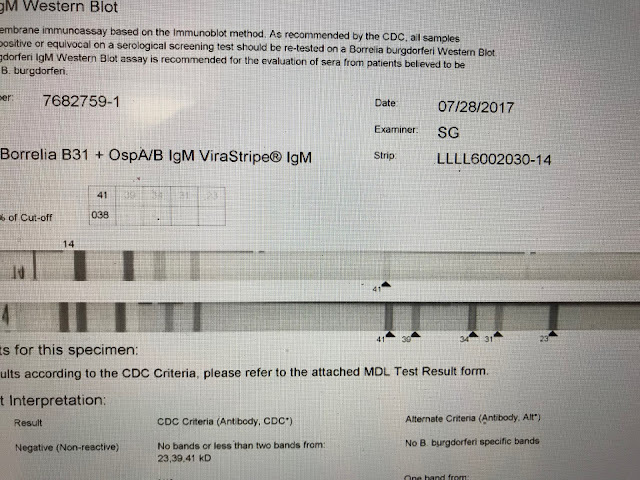 This Blot is positive although it is CDC negative. The CDC requires 5 specific bands not present on this strip. Several very specific bands are clearly present. This report is from IgeneX. Results are presented is a different format. IgM: is it chronic Lyme? I don't care if the bands are IgM or IgG. Lyme IgM bands may persist for years after acute infection. IgG bands may never appear. 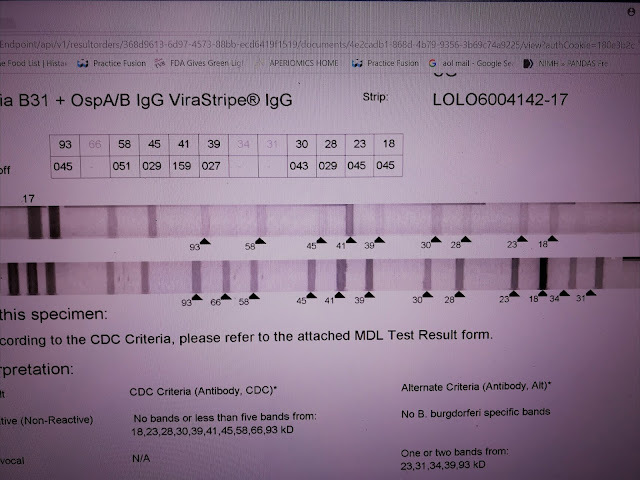 The 41 band as the sole finding does not lead credence to the diagnosis of Lyme. It also does not exclude the diagnosis. Lyme antibodies do not fit into the traditional mold. 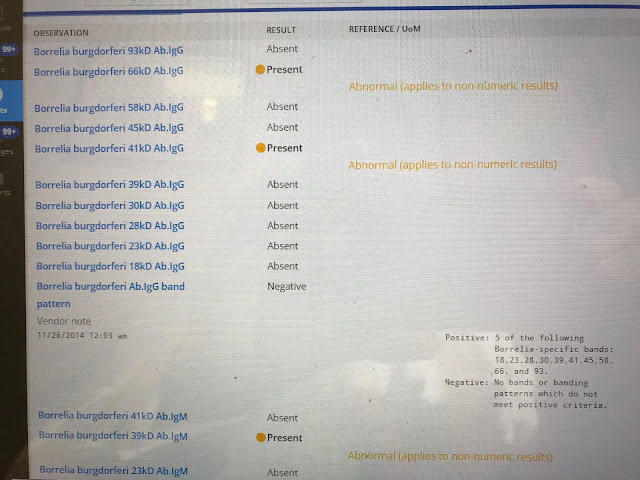 For example, IgM antibodies to the 31 and 34 bands may be present, even though these antigenic proteins do not appear until at least 6 months following initial infection. The 31 band is associated with outer surface protein A. This protein is expressed with attachment to the tick gut and down-regulates - disappears after infection. It only shows up in the host many months after acute infection. If you believe that Lyme IgM antibodies disappear within weeks after acute infection, as proposed by the CDC, this paradox is impossible to explain. There is a story of repeated by physicians which confuses patients as well as their doctors. This is how the immune system works: IgM and IgG responses are predictable. IgM antibodies appear early, immediately after infection. The better, protective IgG antibodies quickly emerge as IgM antibodies decline. When the patient recovers from the illness, higher levels of IgG antibodies are present and no IgM is detectable. Therefore in late Lyme, only IgG antibodies are present. Nice story, but wrong in the case of Lyme. Other infections may have unexpected antibody responses. How do I interpret results? First, it is important to recognize limitations of these tests. The tests are not automated, many steps performed by humans. Therefore, the chance of error is high. Generally, the results from the 3 reference labs are trustworthy. Sometimes repeating the test is helpful. I do not follow any particular guideline approach. Standards which require 2 of the following or 5 etc. lock you in. I would rather interpret results case by case. In my opinion, reading a Western Blot is something like reading an X-ray. A lot of factors are considered -- on the other hand, sometimes Interpreting Blots is like reading tea leaves. Lab tests are adjunctive and cannot be relied upon as the sole means of diagnosing this complex, enigmatic disorder called Lyme disease. Even more important: the CDC standard is for surveillance -- for purposes of monitoring the relative number of cases in different locations over time. This should not be relied upon as a diagnostic standard. My patients is a 29-year-old male who had previously been treated with 10 months of IV antibiotics, including 3 months of IV antibiotics, by another physician which helped a little. When I first met him several months ago he was extremely ill, poly-symptomatic and disabled. The chief complaint was uncontrolled rage. As with so many of our Lyme patients, he had no recollection of tick bite or bull’s eye rash. Blood test for Lyme was borderline trending negative, also common in Lyme patients. He grew up in a Lyme endemic area and use to spend a lot of time outdoors. His symptoms have included: exhaustion, malaise, chills, night sweats, temperature dysregulation, weight loss, poor appetite, trouble sleeping, fragmented sleep, poor endurance, prolonged recovery of exercise, rashes, spots, flushing, blurred vision, double vision, dry eyes, eye pain, tinnitus, dental pain, cough, breathlessness with exertion, air hunger, palpitations and orthostatic symptoms, abdominal pain, nausea, diarrhea, painful swallowing, painful urination, frequent urination, urgency, joint pain, muscle pain, neck pain and back pain, plantar pain, dizziness, vertigo, poor balance, weakness, pins and needles, loss of sensations, depression, anxiety, depersonalization, distractibility, trouble staying on task, confusion, disorientation and getting lost, impaired thinking and brain processing, mixing up words, chemical sensitivity, light and sound sensitivity and food sensitivity. Prominent symptoms include sweats, air hunger and unprovoked bouts of tearfulness. He gives a “good story” for Lyme, Babesia and Bartonella. When I first met with him, the family was in crisis. He lives with his mom and step-dad. He was scaring mom to death and “mad” in both senses of the word; there were frantic calls to 911 and hours were spent in ERs. Psychiatric therapies were consistently ineffective. He was the picture of Dr. Jekyll and Mr. Hyde. Rages, with kicking, screaming, throwing inanimate objects and punching through walls occurred regularly. He remembered the episodes poorly. Antipsychotic meds were unhelpful. He has a prior history of psychiatric illness and a history of 3 psychiatric hospitalizations in his 20s because of similar symptoms and suicidal thinking. I asked some specific questions: “When did it start?” Around age 13-14. “Were you normal before then?” Absolutely, had been an A student, an athlete, well adjusted. “Is there a family history of mental illness?” Some depression. “How did it start; do you remember the first symptom?” Anxiety. “How about OCD?” yes. Thoughts repeat over and over and I can’t control it. “Behavior changes?” Yea. Nervous habits, like chewing finger nails – to the quick. Then, I asked this question: “Think carefully. Did it start suddenly? Were you normal one day and symptoms appeared abruptly the next day?” Not sure. A lifetime ago. But I think it happened that way. Then another question: “did you have a lot of infections as a child?” Yes. I had a lot of ear and throat infections. An ENT suggested I get a tonsillectomy at some point. Discussion: He has PANS, pediatric acute neuropsychiatric disorder which I believe is a unique form of autoimmune encephalitis. The original designation was PANDAS, pediatric acute neuropsychiatric syndrome associated with Strep. The hallmark of the disorder is that neuropsychiatric symptoms, prototypically OCD and tics appear overnight. A variety of infections can trigger the syndrome, including Lyme and other tickborne pathogens. In this case, Strep may have been an inciting cause. Multiple pathogenic organisms can pile on, making the illness more challenging to treat. I consider the possibility of an immune deficiency issue, previously called CVIDS, chronic variable immune deficiency, now defined more narrowly and called a select IgG subclass deficiency. Demonstration of this is necessary for IVIG approval, the treatment of choice for PANS. I can’t ignore the Strep issue. Perhaps he doses need a tonsillectomy. Strep can hide in folds and crypts of tonsils and he is referred back to his ENT. Based on clinical diagnosis, I believe he suffers with Chronic Lyme disease, Bartonella and Babesia. I always am mindful that my diagnoses are hypothetical and avoid anchoring to a particular diagnosis. Needing a place to start, I focus on certain key symptoms, although the focus may change over time. He has a lot of constitutional symptoms – malaise, body temperature dysregulation, poor sleep, weight loss, night sweats etc. This tells me he is actively sick. It points to Lyme. It also points to Babesia, the vast and unrecognized epidemic. Night sweats, air hunger and spontaneous crying point in this direction. Bartonella is a frequent trigger for PANS. Specifically, Bartonella is associated with irritability, anger and rage. In addition, pain on the bottom of his feet and neck pain are clues. Bartonella is notorious for making psychiatric symptoms worse in the setting of a multi-organisms-tickborne syndrome. Treatment. First, I must respond to acute, critical symptoms. Uncontrolled rage is the overarching issue. Even though it is not OCD per say, PANS drugs targeting OCD may work. (incidentally, numerous psychiatrist never got the diagnosis right, most recently a diagnosis of bipolar 2 had been proposed). Although I am not a psychiatrist, I must be familiar with the neurochemistry associated with specific tickborne disorders. I chose two drugs which worked very well. I lucked out. I say this because response to psych drugs, theory notwithstanding, is hard to predict. An old antidepressant, Anafranil and a higher dose of Prozac was highly effective. Psych symptoms quickly receded and became manageable. Anafranil is a tricyclic antidepressant known to work well for OCD, the mechanism not understood. Higher doses of Prozac may also work, and did in this case. This combination was highly effective. I then considered antibiotic therapy. It never ceases to amaze me how many patients previously treated for months and years were never treated with doxycycline. I really don’t think he has tularemia, psittacosis or Brucellosis. But he could have anaplasmosis, ehrlichiosis, rickettsiosis and mycoplasma. Doxycycline treats them all (first or second line). And – it remains one the cornerstone drugs for the treatment of Lyme disease, when combined with other agents. Following my own internal logic, I prescribed doxycycline. He immediately had an exacerbation of psychiatric symptoms. This quickly reverted to baseline when the drug was stopped. I changed to amoxicillin and he did very well. Amoxicillin treats Strep, and, it has poor penetration through the blood brain barrier, a desired goal at that point. He is responding and getting better, week by week. He states, this is the best he has felt in years. Additional antimicrobials will be introduced with great care. I have ordered: brain MRI (negative) brain SPECT pending. Sometimes an MRI may show white matter lesions or other unexpected findings. The SPECT scan is useful and is frequently abnormal in autoimmune encephalitis. The degree of perfusion defects may have some prognostic significance. I must look for an underlying immune deficiency disorder. A history of chronic respiratory infections in childhood is a tip off as well as the presence of persistent, disabling tickborne infection. This requires he receive a Pneumovax (pneumonia vaccine) challenge test. A baseline antibody test of pneumococcal serotype antibodies is obtained; if the baseline test shows little or no immunity to the serotypes, a Pneumovax, (Strep pneumonia killed vaccine) is administered. A repeat test for serotype antibodies is repeated in 4 weeks. If there is little change in a specified number of serotypes, he may qualify for IVIG, based on insurance company bean counters who base approval of IVIG based on limited, specific test results. IVIG is the treatment of choice for PANS, but Mainstream Medicine and insurance companies do not recognize the disease or its proper treatment . Other options, including steroids come in a distant second place. Some readers may be fearful of vaccines. Perhaps they have had bad reaction or heard something in the community . In my experience, the problem vaccines, occasionally associated with autoimmune and other toxic reactions are the DPT, influenza and HPV vaccines. So far, the Pneumonia vaccine has been tolerated OK. To be clear, I am not making a blanket recommendation for or against vaccines. I get a flu vaccine yearly and I recently had Tdap vaccine. A an aside, It is possible the diphtheroid toxins caused by diphtheria bacteria living in your nasopharynx pass into the brain -- and some think these brain toxins may be associated with Alzheimer's. This is supported by published literature. Just a thought. He is thrilled and happy to share his story. Following the plan outlined, I hope he will continue to improve. The words cromolyn, microglia, beta amyloid protein, Alzheimer’s disease, pathogens and Lyme came together, today, at Harvard, where I am attending a continuing education meeting. Dr. Tanzi, a neuroscientist and star Harvard Alzheimer’s researcher spoke of the connection between Alzheimer’s disease and brain pathogens. Dr. Tanzi, author and researcher, discovered Alzheimer’s genes, wrote seminal papers about Alzheimer’s and he hosts TV shows on PBS. Yet, recent research papers, were rejected by the editors/peer reviewers of major journals, because, “they have a different philosophy.” He talked about changing paradigms and it sounded familiar. I wanted to say: publishable findings, in vitro and in vivo results are facts – science. Philosophy is neither. “Philosophy” has historically stood in the way of medical and scientific advancement. (Or do we live in a world of “alternative facts). The Lyme—Alzheimer’s connection has been discussed by neurobiology researcher Ruth Itzhaki in Scientific American and this year Psychology Today warned us of the coming epidemic of Lyme dementia. The related work of Miklossy and Alan MacDonald is ongoing and well known to many. It is well known that Alzheimer’s is related to beta amyloid plaque and associated tangles. It is also well known that the brain is far from the sterile domain we once thought it was. A zoo of microbes, replete with biofilms inhabits our brains. Some of the unwanted occupants are, HHV6, Chlamydia pneumonia, spirochetes (Lyme and others), other bacteria, fungal pathogens, toxoplasmosis and other protozoans. The brain’s immune system may be provoked by one of these germs triggering an inflammatory cascade. Glial cells, the resident immune cells in the brain activate and stimulate amyloid, a natural response to infection, like other well-known endogenous antimicrobial peptides. If the reaction is overheated, excessive amyloid accumulates forming plaques. The B amyloid response is a natural, and generally a beneficial response. Some amyloid is good, too much is bad and none is also bad. Vaccine trials directed against amyloid have failed, perhaps for this reason. Humans are genetically diverse. Some of us tolerate amyloid plaques and for some of us they are disastrous. Harvard researchers screened drug libraries looking for microglial--amyloid “goldilocks” drugs. The most promising is cromolyn (very early stages of investigation), an asthma drug, When researchers screen drug libraries they frequently surprising, inexpiable results. It is fortuitous when FDA approved drugs can be repurposed. Cromolyn is a well-known mast cell stabilizer. Perhaps the dance between glial cells and mast cells in neuroinflammation is relevant. Perhaps not. This is important research to keep pace with (although it can be hard to find studies which go unpublished). Dr. Tanzi said today we wait to treat Alzheimer's until patients are symptomatic (with ineffective drugs), by then the brain is already full of plaques and tangles. It like closing the proverbial barn door when the horse is already out in the fields. Imagine if we didn't worry about heart disease until someone keels over with chest pain, only then considering the person's blood pressure and cholesterol. We need early intervention but we must have a much better understanding of the disease. The use of antibiotics may be inevitable, unless they come up with something better. Introducing, Brittany Goff, MSW, LYME COUNSELING in my office, appointments available, Call: 240-702-0138. Brittany is a former Lyme patient, fully in remission. We did Monster’s Inside Me several years ago together. She knows what its like to have Lyme and coinfections. We are working together on patients with Lyme brain syndromes. Patients may have a variety of manifestations. These include: inflammatory encephalopathy, autoimmune syndromes, neurotransmitter imbalances, specific neurological syndromes (stroke-like, MS-like) and of course neuropsychiatric manifestations. Anxiety, Panic, ADD-like symptoms, mood swings, depression, OCD. Others. Sometimes commonly used drugs, like antidepressants, make things worse because Lyme brains are wired differently. We may have some insights. Treating Lyme disease. Treating Lyme is empirical. There are published studies showing the efficacy of amoxicillin, doxycycline, Ceftin and a few others. There are no published studies which compare the efficacy of various antibiotic combinations that have been used in clinical practice. Test tube data confirms the notion, that in-vitro, drug combinations are needed to effectively treat the disease. Zhang has showed in various studies, that specific 3 drug combinations are the most effective – in a test tube setting. There are clinical scenarios which offer support for the notion that Lyme patients may do best with cocktail treatments, for example, tuberculosis is routinely with a cocktail of 4 drugs. TB and Lyme share common features. Both are diseases associated with pleomorphic, polymorphic, persister forms of the organism. Zhang compared the efficacy of various antibiotics against cultures of Lyme spirochetes and more recently specifically to Lyme round body variants. Lyme round body forms were “induced” when Lyme cultures were exposed to amoxicillin. Interestingly, Zhang was able to culture the round forms and achieve pure cultures of the round form of Lyme. Although metabolically sluggish, compared to spirochete forms, the variants replicated in-vitro, without converting to spirochete form. The results of the two studies were somewhat different. In the first study, Lyme cultures were treated with antibiotics. Persister forms were induced which included small numbers of round body forms and biofilm like colonies. In the second study the efficacy of antibiotics against pure round body forms was evaluated. Changing one variable – a significant one – changed the efficacy of some of the same drugs. Test tube studies do not directly translate into studies in animals (otherwise we could skip this laborious step). There are many known and unknown variables in play when the same drugs are used in a mouse or a human instead of in a test tube. What happens in a mouse may be different from what happens in a dog, primate or human. In vitro provides clues for in vitro research and cannot be directly translated into what might work best for humans. A scientist who performs such studies and reports results, Cannot, should not and will not make recommendations about how to treat patients based on in-vitro, test tube findings. A PhD scientist cannot make any recommendations regarding patient therapy. Even if the scientist also has an MD, as in the case of Dr. Zhang. Patients frequently tell me: this is what Dr. S or Dr. Z recommends, etc. Not correct. Practicing doctors can file the information in the back of their brains and consider it, tangentially, when they make relevant treatment decisions. Doxycycline remains a key part of most protocols. As mono-therapy it has limitations. It cannot kill persister form and round body forms. Something is generally added. Empirically it has been found that 3 drug combinations work best, also supported by in vitro evidence. When doxycycline is poorly tolerated because of GI intolerance, a compounded liposomal form obviates the problem. Minocycline is an alternative, which I have found is less effective. Liposomal forms of a variety of antibiotics are now available and in use. Rifampin has been used successfully when combined with doxycycline. Rifampin was previously shown to confer an antipersister properties to doxycycline (in vitro). Rifampin is very active against Bartonella. Severe Bartonella Herxheimer reactions may occur, possibly an unwanted effect. A positive benefit of rifampin is that it may dovetail with treatment targeting Bartonella species. Sometimes, when Rifampin is poorly tolerated, its weaker cousin, Mycobutin can be tried, less effective in my experience. Clinically, Tindamax has performed well when combined with doxycycline. An in-vitro study by Dr. Sapi showed Tindamax is highly active against round forms and biofilm forms of Lyme. This was not supported by Zhang’s first studies. However, Tindamax demonstrated activity against round forms in the more recent study by Zhang. Other, similar, antiparasitic drugs used have included Flagyl and Alinia. Albendazole works differently, is very expensive, and primarily used for worms or adjunctive to Babesia therapy. Tindamax has great bioavailability and concentrates well in all tissues, very effective. Artemisinin, commonly used as an adjunct in the treatment of babesiosis, found to have great activity against round body forms of Lyme. An earlier study showed it had mild anti-Lyme effects. Artemisinin is used worldwide for Malaria and has other purported medical benefits. This drug, available over the counter is prescribed in a variety of ways. Combination of therapies of doxycycline and artemisinin also dovetail with anti-Babesia therapy, if indicated. Artemisinin not to be confused with artemisia. One derived from the other. Cefuroxime, Ceftin may also be synergistic with doxycycline. Other cephalosporins may be more effective in a test tube, but this is the clinically available agent. For example, a combination of doxycycline, Ceftin and artemisinin may be helpful, with or without the addition of Tindamax or Rifampin. Cipro is active against round forms of Lyme. Cipro performed better than other drugs in the class. There has been a lot of concern about quinolone associated tendon rupture. This is a real concern. Some drugs of the class are preferred. Cipro is somewhat safer than its primary competitor, Levaquin. Cipro is also active against Bartonella. The drug is available in a lower dose which can be titrated. Not a go-to at this time. Bactrim. Sulfa drugs are alluded to (Zhang), like sulfacetamide, only available in eye drops. Bactrim is what we have (see Dapsone). It is a multipurpose drug. It may be active against Lyme persisters and round forms (2 Zhang studies). It is active against Bartonella and it has some anti-Babesia activity when combined with drugs like Mepron. It is a hit or miss drug in my experience when it comes specifically to Lyme. Biaxin A macrolide antibiotics. Has moderate anti-Lyme effects, and in my experience, it is quite synergistic when combined with other antibiotics, including doxycycline and amoxicillin or Ceftin. Despite theory, it is active in the brain and therefore must adequately cross the blood brain barrier. Zithromax, the other option in this family is used primarily for Babesiosis. Biaxin and Zithromax cross over with Bartonella therapies. Penicillin: Amoxicillin can be an effective piece of a variety of regimens. Intramuscular Bicillin, long acting penicillin is effective and must be dosed at least weekly. It is painful and expensive. It should not be used as monotherapy. Dapsone. There is a lot of buzz about this as an antipersister drug. Didn’t show up in Zhang’s screening in-vitro. The drug has several uses which include leprosy. It is used for a variety of inflammatory skin conditions, including dermatitis herpetiformis, the rash seen in celiac disease, hidradenitis and acne (topically). It is a sulfa drug. Based on its mechanism of action it should be effective against round forms, perhaps better than Bactrim – to be determined. It may be somewhat more toxic however. VSL#3 DS. The microbiome, which we wreak havoc upon, is a key part of our immune system. The double strength packet is a pharmaceutical dose, over 900 billion units of bacteria, lactobacillus and Bifidobacterium species primarily. IV antibiotics are frequently called for. Rocephin is the mainstay. It may have antipersister effects. It is frequently used synergistically with other antibiotics. IV Flagyl replaces oral Tindamax. IV Zithromax has been effective when used together with Rocephin and Flagyl. IV doxycycline can be very effective at times. Vancomycin is a big gun but was shown to be active against persisters. Nothing beats daptomycin but it costs $400.00 per dose. Many other IV antibiotics have been used. Others: The Urinary system drug fosfomycin is a broad-spectrum drug and is reported be highly active against round body forms of Lyme. It is available in both oral and IV forms. May be explored in the future. This is by no means an exhaustive list of drugs used in the treatment of Lyme disease. We have a decent armamentarium. Many of my colleagues (Lyme doctors, aka LLMDs) have different strategies. Some doctors are tentative and use creative schedules, like drug A Monday, Wednesday and Friday, drug B Tuesday and Thursday and drug C weekends only. Sometimes very low doses are used, perhaps in an effort to avoid Herxheimer reactions. Some physicians use high doses of antibiotics, welcoming Herxheimer responses. Some only recommend pulse schedules. For example, meds taken 2 weeks on, then one week off. There are an infinite number of possible pulse schedules. I typically use continuous therapy. I find pulsing to be a useful strategy when weaning patients from antibiotics down the road. My philosophy about Herxheimer reactions is somewhere in the middle. Mild to moderate reactions are acceptable. Severe reactions are potentially harmful - to be avoided. There is no right way to prescribe antibiotics for chronic Lyme disease based on the current state of the art. (There may be wrong ways). No one has the magic formula. What works for one may not work for another. Every patient is unique. I work with each patient searching for the solution that works best for him/her. Some physicians prefer standardization and same-ism for purposes of learning and research. Essentially each patient gets approximately the same therapy. Again, there is no one right way. It is a matter of personal preference. Patients should know the physician’s philosophy. These notes refer to Lyme only. It therefore does not describe typical complete therapy for a typical patient. Treatment frequently entails therapy for Lyme and coinfections at the same time making things more complicated. The listed drugs are those commonly used in clinical practice. Comments regarding test-tube research may be interesting, but are in way directly determinative of therapeutic choices. There is no new magic bullet, but we learn something new every day. The reader may notice that 2 recent posts are contradictory. September vs November, 2017. Comments in September are based on information published by a group in California, at Stanford. The latter comments are based on work from Baltimore, MD, Johns Hopkins. Both groups screened drug libraries looking for "hits" highly active against Lyme. They got dramatically different results. What's going on! The California group based their research on 2 strains of Borrelia burgdorferi frequently found in the West Coast and the Hopkins group used the standard B31 strain commonly found -- where? This may account for some of the differences. Lyme. How do you diagnose it? Here I am talking about the chronic form of the disease, not the acute form. You made have heard, Lyme is a clinical diagnosis? What does that mean? Roughly, it translates: Your doctor may diagnose Lyme despite negative objective data, such as laboratory tests. How do we get there? For one thing, your doctor needs to have a high index of suspicion, something qualitative, although based on something quantitative. I going to make a controversial statement. Lyme can only be accurately diagnosed by a physician who is appropriately qualified. A doctor needs to know: how common the disease, geographically, around his/her medical practice, where the patient lives and the patient's travel history. The physician knows to assess the patient's risk with regard to lifestyle. The physician processes a good understanding of the wide range of symptoms and syndromes associated with Lyme and related infections, which may include very strange symptoms – or common symptoms. The term index of suspicion refers to a prioritization of possibilities. Doctors who are qualified to make the diagnosis are doctors who are properly informed; it has nothing to do specialty, subspecialty, diplomas on the wall or letters at the end of a name. For example, infectious disease experts and rheumatologists do not automatically qualify as doctors who can at this time, accurately diagnose Lyme disease. When a doctor evaluates any patient, consciously or unconsciously, he/she constructs a list of possible diagnoses, referred to as differential diagnoses or diagnosis. Lets briefly discuss an example. A patient complains of sudden knee pain. Here is how 2 doctors might consider possible causes, in order of likelihood. Doctor A (low index of suspicion for Lyme): Trauma. Other structural disruption of joint. Aches and pains of life. General inflammation, bursitis. Osteoarthritis. Autoimmune - RA, lupus. Reactive arthritis, Reiter's syndrome. Crystal arthritis, gout, pseudogout. Infectious arthritis, GC, Chlamydia, Staph, other. Lyme disease, other inflammatory diseases like Crohn's disease and others. Doctor B (high suspicion): Trauma, Lyme disease and then all the others (different order). Caveat: Dr. B has no business diagnosing Lyme or anything else, if he/she is not intimately familiar with the above causes of joint pain. You can't rule out something else if you're not aware that that something is exists. The entities listed about are covered in depth in medical school and CME courses, and many are seen in clinical practice. The requirement that the doctor be informed about non Lyme issues, better than average, is something that cuts both ways. The CDC estimates there are 300,000 new cases of Lyme each year, this is called the incidence of disease. The 30,000 yearly number is based on reporting criteria, to be used for epidemiological trends, not a pronouncement of the actual number of cases. The number of people with Lyme disease in the population as a whole, with any stage of the illness, is called the prevalence of the disease. This number may encompass asymptomatic cases, since they may become ill at some time in the future. If you don’t believe in chronic Lyme, you would argue against these inclusion criteria. We may infer that an astronomical number of Americans may have some form of Lyme disease. We don’t really know the true number, but it is very large. Some new cases occur in patients already suffering with the disease. This adds to the incidence number but doesn’t change prevalence. Eighty percent of acute cases get better with standard therapy etc. These cases are excluded from prevalence and so on. Most patients with Lyme, were at some point told their problem is: psychosomatic, fibromyalgia, stress, depression etc. Alternatively, they are misdiagnosed with rheumatoid arthritis, multiple sclerosis etc. Why? In 2018, most doctors have a low index of suspicion for Lyme. Depression is very high on their radar. Why? Something is seriously wrong with organized medicine which has buried the biggest epidemic of our time. Makes you angry. Doctors in general are programmed to think of Lyme as only acute Lyme. The false narrative is repeated: Tick bite, bull’s eye rash or Bell’s Palsy, swollen knee, carditis, meningitis and that about it. Lyme is acute not chronic. Lyme is geographically limited. Blood tests are reliable, especially in chronic cases. Same for the past 20 plus years. A doctor should recall something he heard in medical school (at least I remember it): When a patient has an unusual presentation, it is more likely caused by a common disease than an uncommon one. Assuming a high index of suspicion, this notion was tailored made for Lyme. Patients may present with a single issue, like tendinitis or night sweats or the acute knee pain, discussed above. More often, patients present with a collection of complaints reflecting involvement of multiple organ systems. I start with the patient history in this discussion of diagnosing Lyme disease and this is a clear reason why. Making the correct diagnosis of an illness relies on the following with relative import of contribution, 85% history, 10% physical and 5% lab. This was also tailor made for Lyme. Diagnosis is based eighty-five percent on a patient’s history. 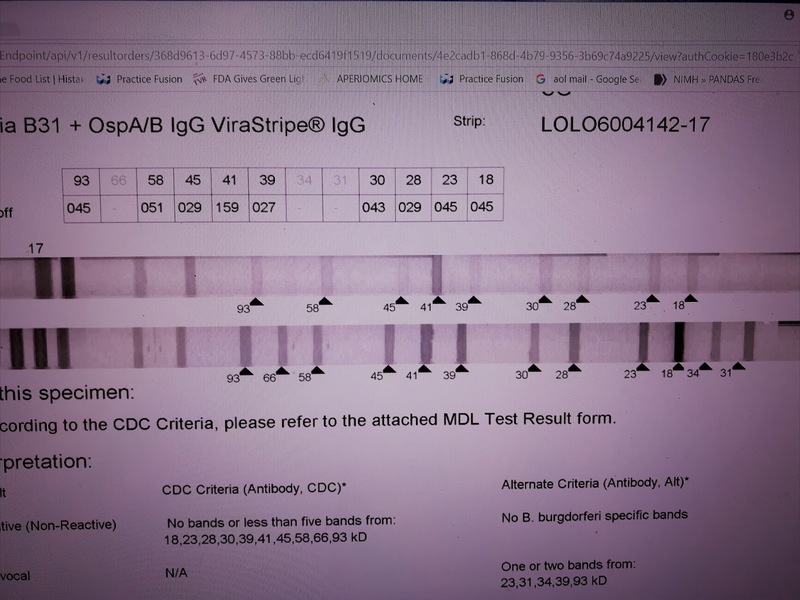 Stop obsessing about CDC positive, IGM vs IgG etc. I think a major obstacle here is that patients have been told by a zillion doctor that they don’t have Lyme. Patients want the feel of a piece of paper that says, Lyme positive, so they can be at last vindicated. Sorry to burst your bubble. 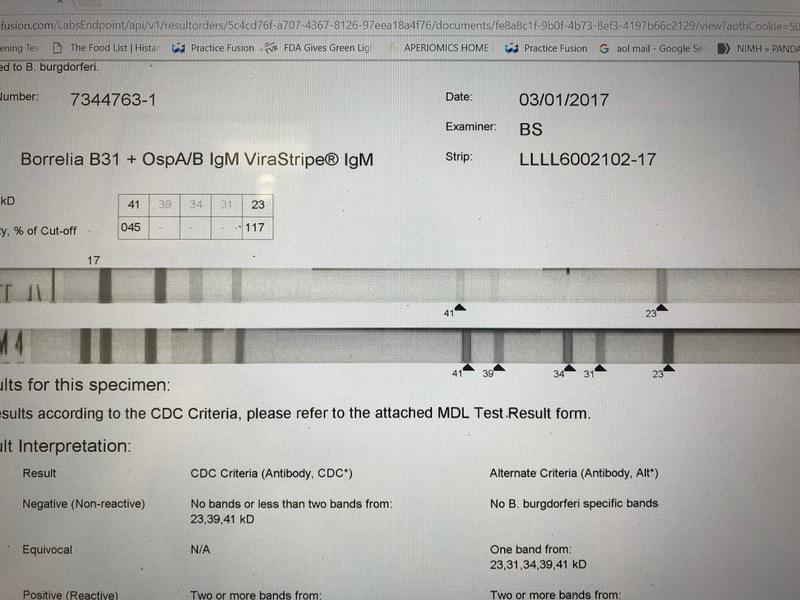 When you take your lab results back to your Ivy League experts, they say, the testing laboratory is garbage, they don’t believe it, it’s a false positive or something along those lines. Patients with chronic Lyme have a lot of symptoms and frequently strange symptoms. (You don’t have to have all of these, or any of these to have Lyme). Patients are tired and nearly all complain of poor or interrupted sleep. Many have fevers, night sweats etc. Their endurance is shot. When they try to exercise it’s a disaster and it takes days to recover. They may have a variety of skin problems. Vision is weird, they can’t focus, and the eye doctor says everything is perfect. They have ringing in the ears. They have swelling of lymph nodes. They having breathing difficulties, especially the classic “air hunger,” can’t take a deep breath or find enough air in the room. They have heart palpitations and skipped beats. They have chest pain. Their bowels and bladder don’t work right. They have headaches, front or back, with neck pain. They have pain of variable intensity, mild to incapacitating. The pain is migratory (travels). One days it’s the knees and elbows and next day it’s the hands, wrists and fingers, etc. Usually joints don’t swell, sometimes they do. Muscles hurt. Tendons hurt. Patients experience shin pain and foot pain. Patients usually have neurological symptoms: dizziness, off balance, numbness and tingling, burning sensations, electrical sensations, weakness, clumsiness, dropping things, etc. Most have psychological and psychiatric symptoms. and/or changes in cognition. Brain fog. Can’t remember names of things. Memory loss. Confusion. Getting lost. Putting things in the wrong places. Can’t pay attention or focus. Feel like they are getting Alzheimer’s etc. Worried they can no longer do their job. Craziness. Depression. Mood swings. Crying for no particular reason. Irritable, angry, rageful. Bipolar symptoms, ADD symptoms, even hallucinations and, Other. Clarification: the term Lyme, as I use it, generically includes common coinfections. Geography: Lyme is more common in Maine than Arizona. This doesn't exclude Lyme from consideration in Arizona. Informed doctors have a good sense for the incidence and the presence of the disease in different locales. CDC reports must be viewed in context. For example, when the CDC says no cases of Lyme were reported in Georgia, these facts are in play: The disease is miserably underreported in some states, counties and cities. This may be largely due to physician misinformation and ignorance. Many doctors are fair with the diagnosis of acute Lyme disease. Predictably, large numbers of cases should be expected up and down the Eastern Seaboard. These states have certain factors in common: bird migration, fauna and flora, mouse and deer populations and tick population. High risk, outdoor activity is more common in the South. Few cases of Lyme would be expected in arid, dry dessert regions of the country on the same basis. The idea that Lyme is only found in the Mid-Atlantic and the Northeast is part of an antiquated, false narrative. Some people fill out check lists on line which are scored. Standard instruments may have value as a screening tool. I like to get the history directly from the patient. The “flavor” of the patient’s experiences, contextually, is very helpful. Some patients check off every symptom, but when questioned may say, I had a little of this or that 5 years ago, etc. Diagnosis must be confirmed by the physician. There are of course patients with other presentations, like a new headache that won’t go away and many, many others. Those cases may be more difficult. A patient I saw today presented only with insomnia and new severe, persistent, daily headaches. In these cases testing may be more important. The physical exam frequently gives clues, discussed elsewhere. 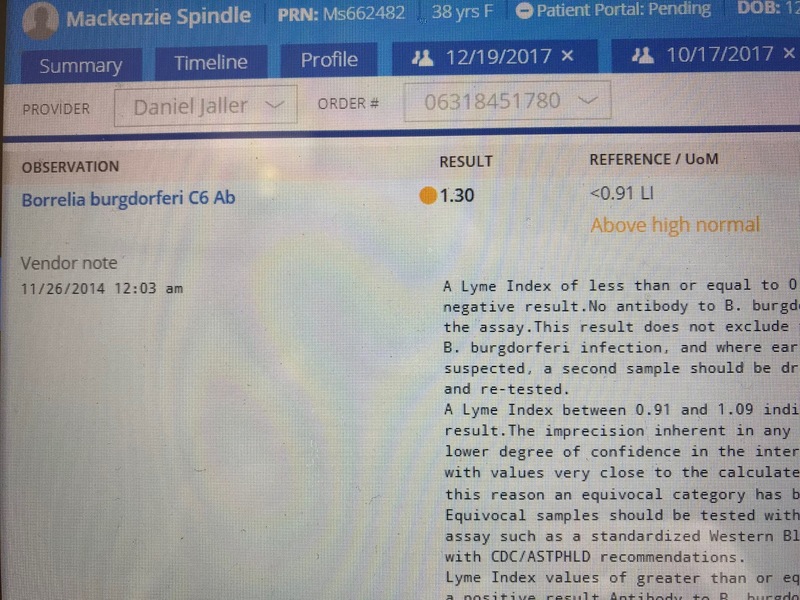 If laboratory results are only 5% inputted data needed for diagnosis of Lyme disease, then it is much more important to adjust attitudes (physicians and community) rather than develop new testing technology. New technology may be important in the future for many applications. If this is correct, it is a bad idea to spend a ton on lab studies, some of which are still in beta testing. 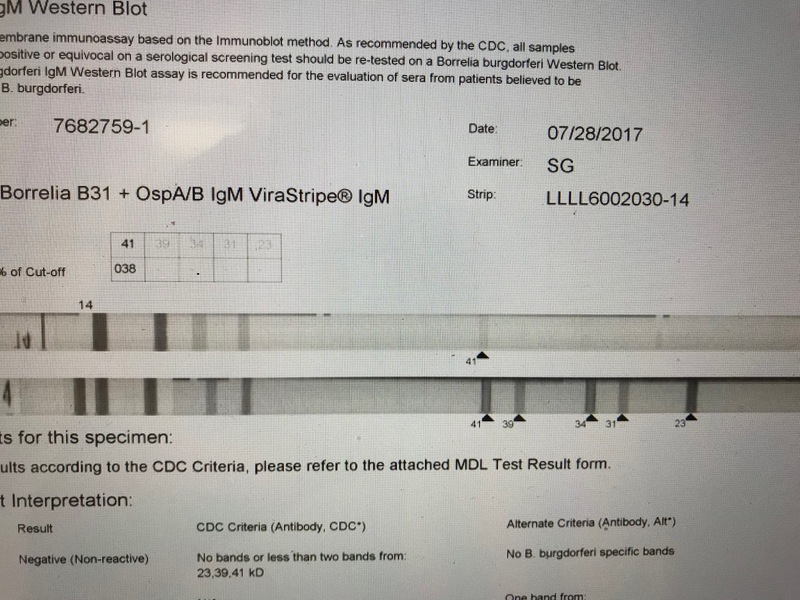 A Lyme Western Blot from a specialty lab like MDL or IgeneX and a coinfection panel which can be obtained from standard mill labs, LabCorp and Quest. There are many variants. I like to add C6 peptide. Bartonella henselae antibodies, not PCR. Babesia microti antibodies. Babesia duncani WA1 antibodies (Quest). Ehrlichia and Anaplasma antibodies. Rickettsia, RMSF or Rocky Mountain Spotted Fever antibodies and that’s about it. If I want to look more carefully for Babesia I do a Giemsa in my office or consider a FISH IgeneX. That’s it. When in doubt, I might order the occasional Ispot test. Nanotechnology may be on the horizon. Generally it is not helpful to order serial Western Blots, except for “seroconversion” test. Repeating the same test over and over again, expecting a different result is the definition of insanity. There are many opinions about laboratory testing which are equally valid. This is my opinion only. Key points: clinical diagnosis – detailed history is key. High index of suspicion. Doctor must be knowledgeable about the disease. Patients must also be knowledgeable about the disease need to be their own advocates. Problem with better test: No matter how great the test is, the nonbelievers, who currently control the world of medicine, will find ways to discount the tests and otherwise disparage the results and the doctors who order the tests. Remember: If a patient has a rare presentation, it is more likely due to a common illness than a rare illness. And, Lyme is a common illness. Does it sound like I am saying only doctors known as LLMDS can diagnose Lyme. In fact, this is what I am saying. Even if another doctor gets the diagnosis right, they will not understand the disease and therefore not prescribe the correct medicine(s). Perhaps you are thinking: That's all well and good but, after considering all the factors, my doctor is not sure if I have Lyme. In this case, the doctor must go back to square one and construct an exhaustive list of possibilities, including such things as cancer. The doctor must carefully go the list, one by one, and eliminate all the possibilities. At the end of the day, with all other causes of symptoms or illness eliminated, Lyme is all that's left. It's the Sherlock Holmes rule of medicine: Once you have eliminated the impossible, then whatever remains must be the answer. The doctor may be worried that there is something he/she forgot to check. This is fine. Doctors would do a better job all around if they thought of their diagnoses as hypotheses, a theory that might explain things. For example if it fibromyalgia was a hypothesis, rather than a diagnosis, the treating physician might be less upset when a competing hypothesis, e.g. Lyme, is inserted. With this in mind, Lyme can be a tentative or working diagnosis, a hypothesis. If things don't go as expected it may be useful to go back to square one.